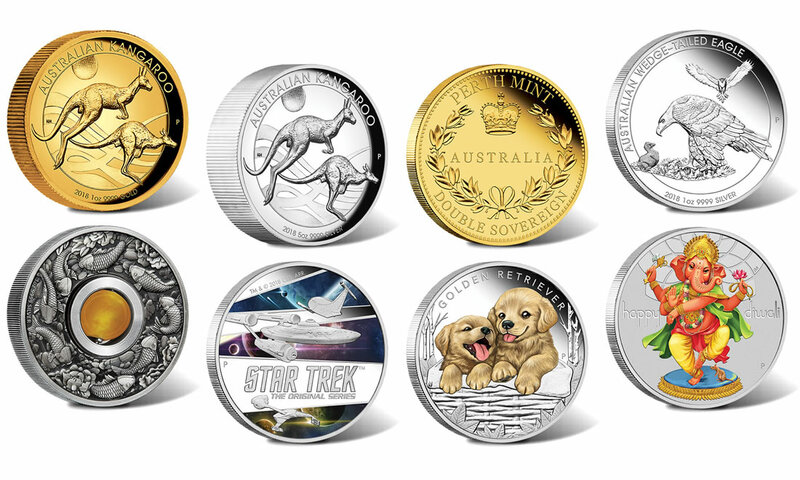 The Perth Mint of Australia released its July collections of gold and silver coins. The Mint’s latest collectibles showcase Australian Kangaroos, golden retriever puppies, ships from Star Trek, koi fish, Ganesha, and St. Edward’s crown. Sizes of the coins range from 1/2 ounces to 5 ounces and their finishes are proof or antiqued. The purities of each — whether gold or silver — are .9999 fine except for the limited-edition gold sovereign which is struck in the traditional 22-carat composition of .917 fine. Images and summary information for the July collector coins is available below. 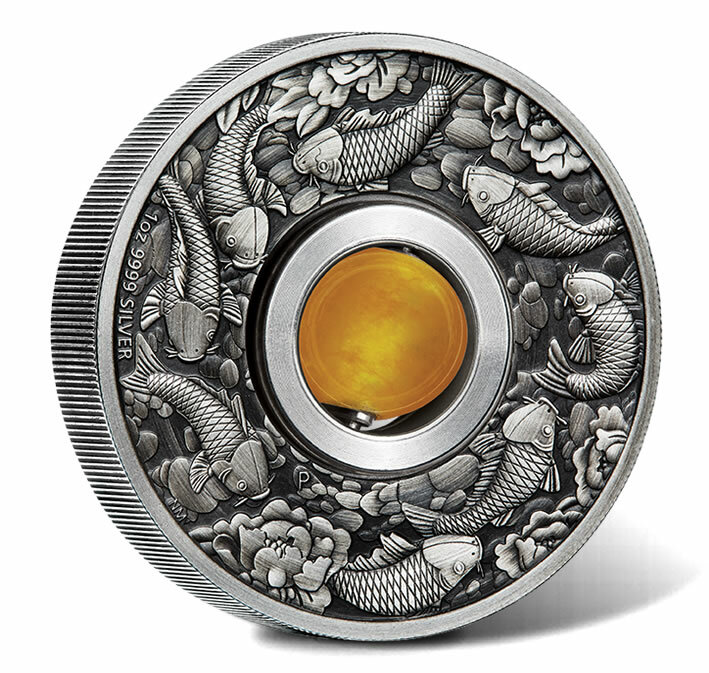 Produced with an antiqued finish, the Good Luck coin’s reverse or tails side features eight koi fish swimming beneath peonies and around a yellow topaz charm that rotates. Koi fish have long represented perseverance and strength of purpose in eastern cultures. As such they have become a symbol of good luck, abundance, courage, independence and ambition. Eight is considered the most propitious number in Chinese culture. Yellow topaz in Chinese culture has traditionally been associated with good fortune and energy. This Tuvalu legal tender coin is limited to a mintage of 3,000 pieces. 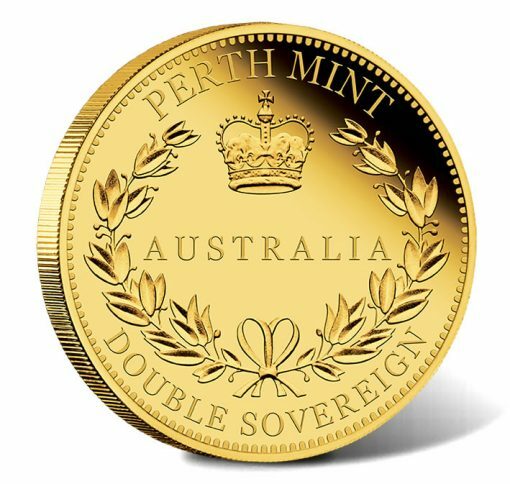 This commemorative gold coin incorporates elements of the original ‘colonial’ sovereign first produced in 1855 by the Sydney Mint. Struck from 91.70% gold, the coin has a mintage of only 500. From 1871 the coins featured Imperial designs with ‘S’, ‘M’ or ‘P’ mintmarks respectively identifying their place of manufacture in Sydney, Melbourne, and Perth. This collector coin prominently bears reverse inscriptions inscription of PERTH MINT, AUSTRALIA, and DOUBLE SOVEREIGN. It is limited to a mintage of only 500 pieces. 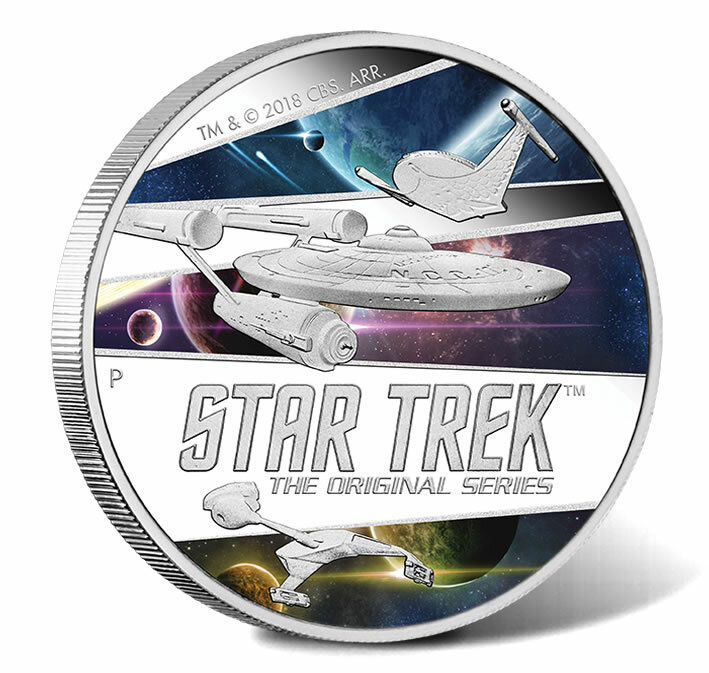 This coin from the Mint’s popular Star Trek program celebrates the three key ships that appeared in the original Star Trek television series: the starship U.S.S. Enterprise NCC-1701, a Klingon D7 Battle Cruiser and Romulan Bird-of-Prey. The three ships appear against a coloured intergalactic background. This Tuvalu legal tender coin is housed in a replica of an Original Series communicator and is limited to a mintage of just 850 pieces. TM & © 2018 CBS. ARR. One of Australia’s most iconic bush creatures, the kangaroo, comes to life on these gold and silver high relief coins. 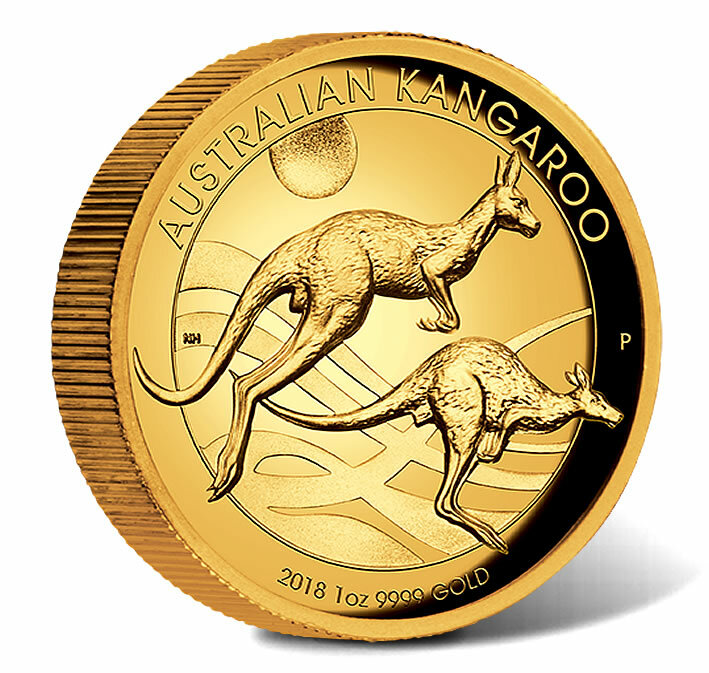 Each coin’s reverse features the same design, two kangaroos in a stylised rural landscape bordered by the inscription AUSTRALIAN KANGAROO. 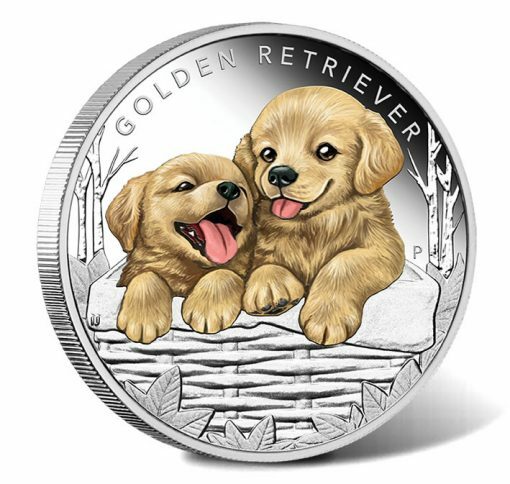 Only 500 1oz gold, 500 5oz silver, and 10,000 1oz silver coins will be released. 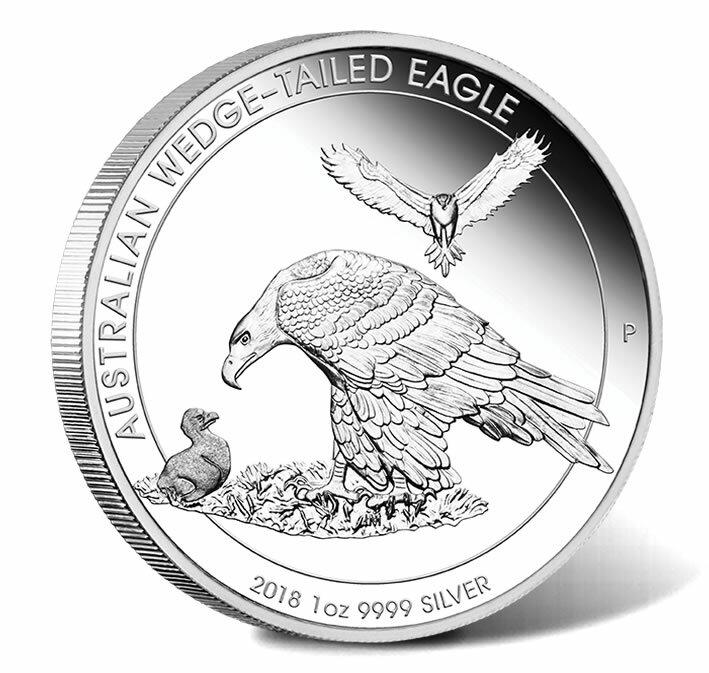 This 1-ounce silver coin celebrates one of Australia’s most incredible birds of prey, the wedge-tailed eagle. Its reverse depicts a mother wedge-tailed eagle looking down on a chick. A male bird is seen hovering above them with its magnificent wings fully extended. The Australian legal tender collector coin has a mintage of 5,000 pieces. 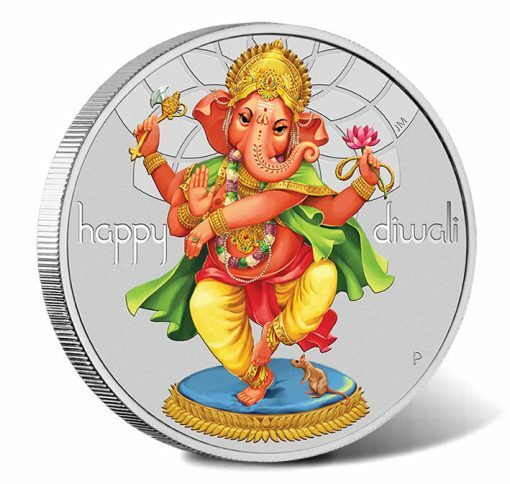 Both gold and silver Diwali coins share the design of representation of Ganesha holding a lotus flower and an ornamental axe, with a mouse at his feet. Diwali is an ancient five day Hindu ‘festival of lights’. Celebrated by millions of Hindus, Sikhs, Jains, and some Buddhists around the world, it is considered one of the happiest holidays in India and Nepal. These are Tuvalu legal tender coins. The silver coin is limited to 5,000 pieces with each presented in an attractive latex case. 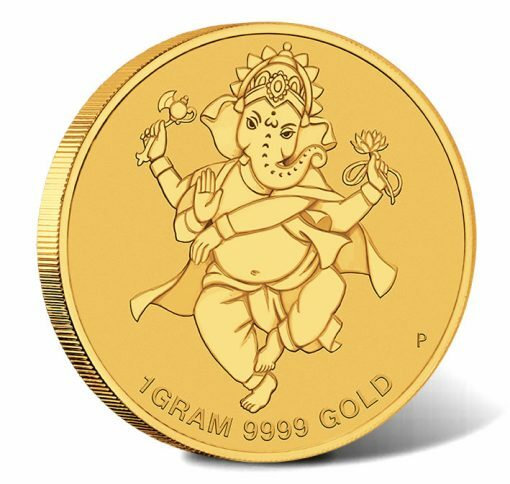 The gold coin will be minted to demand and is presented in a card with room to write a message. One of the most adorable and popular dog breeds, golden retrievers, is featured as puppies on this 1/2oz silver collector coin — the third of five issues in the Mint’s adorable Puppies series. The two puppies are shown playfully looking out from a basket. This Tuvalu legal tender coin is limited to a mintage of 5,000 pieces. Additional information, ordering options and current pricing on the coins are available from the Perth Mint’s website at www.perthmint.com.au. Here is an affiliate link to the Mint’s newest releases. 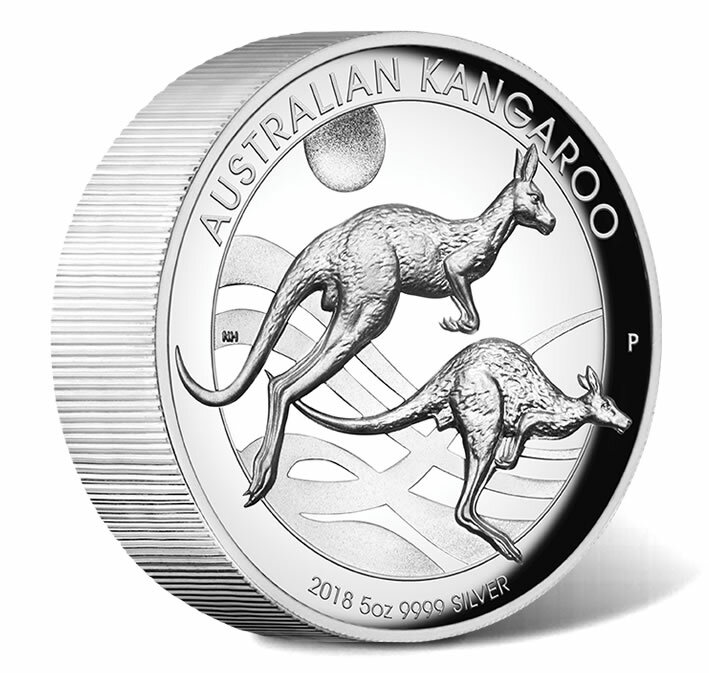 Perth Mint Australia is offering free S&H to USA residents today & tomorrow for 4th of July promo!